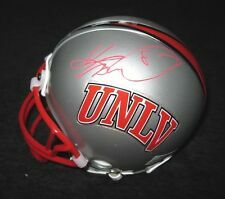 This is an UNLV Rebels grey mini helmet that was personally autographed by Randall Cunningham. This helmet includes a certificate of authenticity from James Spence Authentication (JSA) and Denver Autographs. This is an UNLV Rebels red Riddellmini helmet that was personally autographed by Randall Cunningham. This helmet includes a certificate of authenticity from James Spence Authentication (JSA) and Denver Autographs. This is an UNLV Rebels red Schutt mini helmet that was personally autographed by Randall Cunningham. This helmet includes a certificate of authenticity from James Spence Authentication (JSA) and Denver Autographs. This is an 8x10 photo that has been personally signed by Jerry Tarkanian.This item includes a certificate of authenticity from Denver Autographs.com and a Tri Star hologram. The photo was signed at the 2018 NBA pre draft combine. I have available this 8" x 10" photo that has been signed by Larry Johnson. SIGNED ACTORS. SIGNED ACTRESSES. SIGNED BASEBALL. SIGNED BASKETBALL. SIGNED BOOKS. SIGNED CHECKS. SIGNED COLLECTIBLE TOYS. Here we have a UNLV Rebels TIM CORNETT Autographed 8x10 Photo! This is a have for any Rebels fan! Stacy Augmon Signed SI Magazine. Randall Cunningham Signed UNLV Rebels Black/White Photo. Hand-signed in blue felt-tip pen by Randall Cunningham. Larry Johnson Autographed White Hornets Custom jersey JSA W289741. Great for any Larry Johnson or Hornets fan! They are featured on the staircase of an airplane. The overall size of the display is 22×28″. Authentication: 100% Authentic Team. Credit Cards. This is an index card signed by Jerry Tarkanian. This would make the perfect and RARE gift for any UNLV fan. Larry Johnson Signed UNLV Rebels Jersey. Hand-signed in black felt-tip pen by Larry Johnson. Custom on-court style jersey. Jerry Tarkanian coached college basketball for 31 seasons over five decades at three schools. 1952 Pasadena City College Year Book & Jerry Tarkanian Signed Photo- JSA. The signature on the 8×10 photo is in blue felt pen and grades a (9). This floorboard looks just as great in the pictures, in person! HERE YOU GO REBEL FANS. 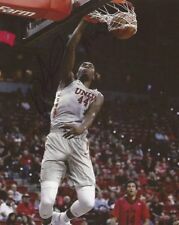 Hi you are bidding on a DAVE RICE AUTO AUTOGRAPHED 5X7 PHOTO SIGNED PICTURE W/COA UNLV RUNNIN REBELS! All of the autographs I sell come with a COA and are hand signed which means that you will get a full refund if the autograph fails PSA or JSA. If you have any questions please do not hesitate to ask me. I do give shipping discounts if you win multiple items! Good luck!